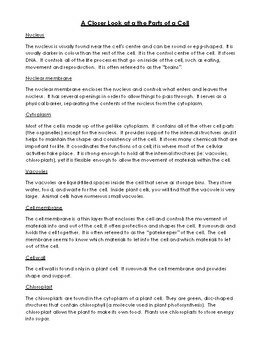 This handout provides clear and concise definitions of many parts of the cell. These include the nucleus, nuclear membrane, cytoplasm, vacuoles, cell membrane, cell wall, and chloroplast. It acts as a great resource whether students are first learning about cell parts, or if used as a review study sheet.